I dragged my zombie-like self out of bed this morning to gaze at small dots on the ocean's horizon. Granted, these ant-sized figures were careening down raging 40-foot barrels of frothy sea water at Mavericks, one of the scariest big wave surf contests in the world. But if these fools could stand up to tempt death, the least I could do was wake up before 9am and run a brush through my hair. The presence of ambulances and SUVs full of cops gave the impression that some kind of commotion had recently transpired, and I soon found out rogue waves had just pummeled hundreds of beachside bystanders, sending many to the hospital with broken bones, bloody arms and twitchy stories of near-drowning. 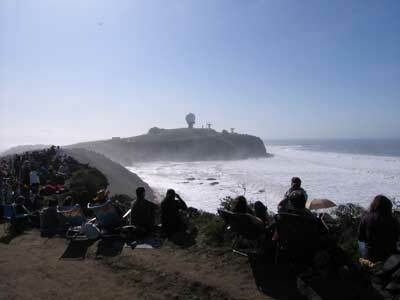 From the safer upper bluff, thousands set up blankets and chairs to watch sets of monster tides crest and slap down everything in their paths, and we all sucked breath every time a surfer took the suicide plunge.